So, a couple of weeks ago, I caught a tweet about VeloInk. Having had a desire to have my name on the toptube ever since Trek started offering the Project One line during Lance Armstrong’s reign. Anyway, Matt at Veloink was amazing. Within an hour or so of me placing the order, he’d dropped me an email to confirm that, yes, indeed, I really wanted the Nutmeg state flag, rather than something that’d be clean at the resolution his machine could print. I said “Yep”, figuring that it’d either be funny to those who recognized the flag, or an obvious but inside joke to those that didn’t pick up on it. And mostly, it’d be an attention grabber to pimp this website. And maybe, just maybe, a theft deterrent. I went with plain white with black letters – not quite original, but there were plenty of other choices. They’ve been sticking solidly to my commuter for 3 months in the cold and rain. 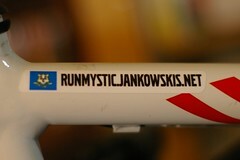 Eventually, I’ll have my dream of a custom frame with custom paint and lovingly hand-lettered “Jank” on the top tube. However, that’s somewhere about a decade away (Got to get the kids into college before my marriage will survive the request); till then VeloInk rocks. $18 well spent. Aping off of Randomduck, who’s got a great tradition of this. Mostly it’s thanks for reminding me what a great album Boy was. So, I subscribe to Dictionary.com’s Word of the Day. Usually, it bores me (Rocked the SAT Verbal). Best part, is I think I can use it. It’s defined as “Someone who is skilled in table talk”, which describes lots and lots of folks I encounter in my job. I am so obsessed with this song on so many levels. So, I’m an unabashed fan of Nike+iPod. Love it, love it, love it. And, I’m favorably inclined to Lance Armstrong. Not a huge fanboy, but, barring some bombshell revelation of pictures of him with gallon jugs of EPO, an IV in his vein, and random farm animals smoking post-conjugal cigarettes, Lance is OK as far as athletes go. (I’m still miffed at the whole Kristen split – seems entirely at odds with his views on marriage in “It’s Not About the Bike”, but we’ll leave that dog lie). Anyway, Nike’s announced a “Run Like Lance” challenge, where it aims to collect 50K miles through Nike+iPod prior to the NYC Marathon in November. Nike will donate $1 to the Lance Armstrong Foundation (LAF) for every mile run and logged by Armstrong and runners that visit www.nikeplus.com from October 2nd until November 5th. … Armstrong recently selected five New Yorkers, one from each borough, who are participating in this year’s marathon to serve as borough captains in the “Run Like Lance Challenge.” Runners from around the world can also contribute by logging on to www.nikeplus.com to donate miles to the borough of their choice.